Takayasu Michitoshi, a prominent resident of the village of Takayasu, Kawachi Province (in the present day, near Yao City in Osaka Prefecture), believed a slanderous story about his son, Shuntoku-maru, and disowned him and sent him away. Regretting this misdeed, Michitoshi wants to pray for the peace and comfort of Shuntoku-maru’s current and next lifetimes, so he performs the Buddhist practice of making offerings (that is, making offerings of material goods to people in order to accumulate good deeds) for seven days in spring at Tennō-ji Temple (present-day Shitennō-ji Temple, Osaka). On the last day of his practice of making offerings, a young blind beggar called Yoroboshi (or Yorobōshi) appears at the temple. The beggar is actually his son, Shuntoku-maru. 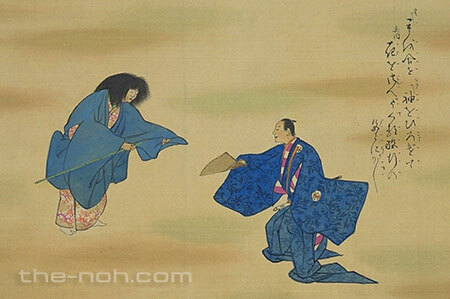 When Yoroboshi joins the line of people receiving offerings, fallen plum petals are clinging to his sleeves. Seeing that Yoroboshi cherishes the scent of the flowers, Michitoshi mentions that the flower is also a part of the practice of making offerings. Yoroboshi agrees with him, lauds the teachings of the Buddha, and explains the origin of Tennō-ji Temple. Although Michitoshi realizes that Yoroboshi is his son, Shuntoku-maru, he decides to wait until night to reveal his identity, as he wants to avoid others’ attention. Michitoshi suggests that Yoroboshi conduct jissō-kan (a form of meditation in which a person imagines the Land of Nirvana from watching the setting sun), and Yoroboshi imagines the beautiful scenery of the Naniwa area. However, he gradually becomes delirious, and trips and stumbles here and there. He is bitterly ashamed of himself and feels defeated by the sadness of being blind. When the night grows late, Michitoshi reveals to Yoroboshi (Shuntoku-maru) that he is his father. Shuntoku-maru tries to flee as he is ashamed of his present state, but Michitoshi catches up with him, takes him by the hand, and brings him back to the village of Takayasu. 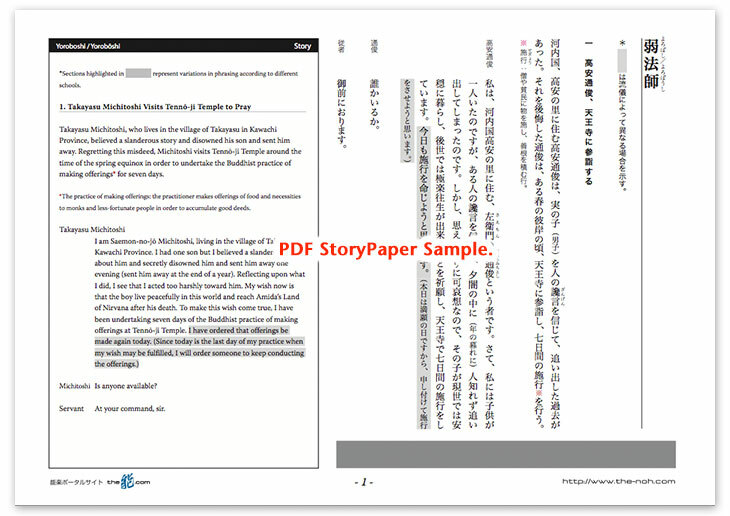 The greatest charm of this piece is the profound personality of the shite, Yoroboshi (Shuntoku-maru) and the vivid descriptions of the scenery in his mind. Although Shuntoku-maru is described as a boy, he is probably in his mid- to late teens, with some education and experience, as his wife appears as the tsure in the version performed in olden days. And his father, Takayasu Michitoshi, appears to be a powerful local figure. Shuntoku-maru has fallen in stature from being the son of a prominent family to being a blind beggar (at the time, considered the lowest social status), but he has never lost the purity and refinement of his mind. Although he laments his misfortune, his faith gives him hope, as we can observe from his enjoying the scent of plum blossoms on his sleeves. Later on, when Shuntoku-maru is meditating on the setting sun, it brings to mind the beauty of the seaside in Naniwa, where he used to live, and he makes this profoundly meaningful comment: “All of this terrain, as far as the eye can see, exists in the mind.” However, as his mind is transfixed by the scenery of his imagination, he becomes delirious. Tripping and stumbling, he is forced to face the reality of his pathetic, hopeless self. Pure, kind, lonely, and sorrowful is this profound young man, Shuntoku-maru. Please try to feel each of these sentiments of Shuntoku-maru as they change from scene to scene.